Lake Guard™ Implemented in Aquaculture - BlueGreen Water Technologies Ltd.
A growing number of publications indicates that cyanotoxins accumulate in the tissues of organisms living in infested waters and can be transferred through the food chain to preying animals or humans. These findings are putting the entire aquaculture industry in jeopardy, turning cyanobacteria-associated damages from taste and color issues into a health hazard altogether. 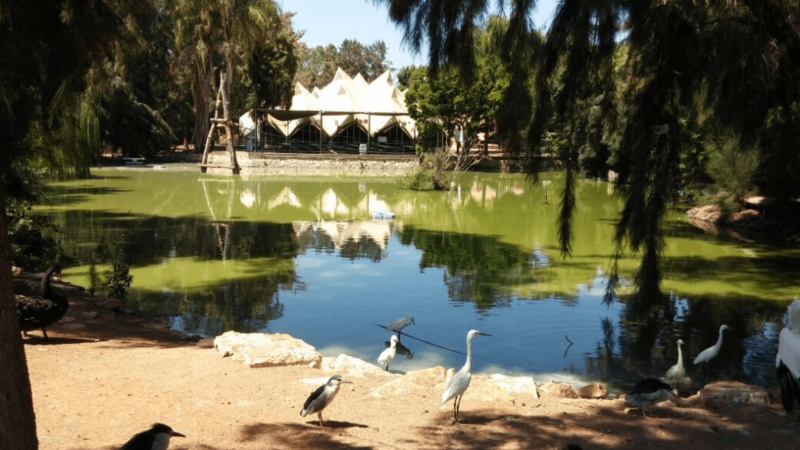 This trial is the first of a series of trials in the aquaculture sphere, conducted in Israel’s “Safari” National Zoo at its request and in an attempt to suppress a massive bloom that was interrupting the regular operation of the zoo as well as presenting a real health risk to the vast number of animals relying on the affected water body. It was conducted under the supervision of Dr. Orr Shapiro from the Volcani Institute – Israel’s National Agriculture Research Center. The trial was conducted in a 2,000 m2 freshwater pond heavily infested primarily with Microcystis sp., with a cell density of ~108-109 cells/ml and an initial Microcystins concentration of ~6µg/L. Given the magnitude of the infestation, it was decided to begin with a treatment regime of 5g/m2 Lake Guard White™ to be repeated as needed according to the real-time conditions in the pond. Measurements were taken periodically (initially more often and later more seldom), followed by an immediate decision whether to treat again or not. When treatment was applied, a secondary measurement on the same day was taken within 24 hours after application. Treatments were applied on day 0, day 1, day 8 and on day 20. Each of the four treatments resulted in an immediate sharp drop in phycocyanin (cyanobacterial mass), chlorophyll-a as well as in microcystins levels, indicating an immediate improvement in water quality. As indicated from the decreasing frequency of the treatments, each subsequent treatment resulted in a longer effect, with the last one, coming shortly after a heat-wave, lasting till the end of the trial, some 2.5 months later.